Well, my HTC One finally arrived yesterday after an agonizing 2 week wait. But in the end, it was well worth the wait because I only paid $574 for an unlocked version directly from HTC.com. Of course, unlocked here means that the phone is “SIM” unlocked for using with any GSM network, the bootloader is still locked (but you can use HTCDev.com to unlock that). The unlocked HTC One is probably the “best deal” in town right now at just $574 with LTE support and latest Qualcomm Snapdragon 600 processor. You will have to cough up at least $100-200 more for Galaxy S4 with LTE (GT-i9505). 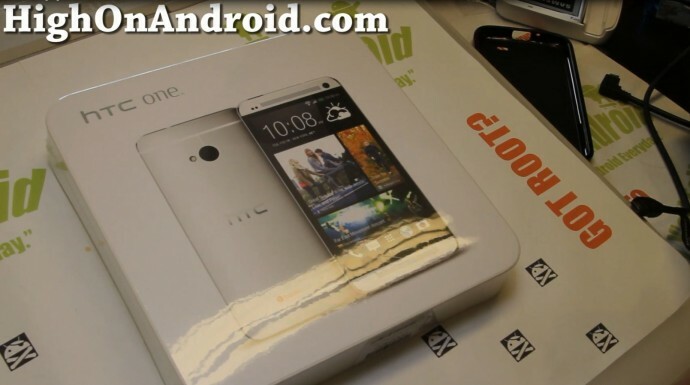 My initial thoughts on the HTC One? Does it feel good in my hands? Yes, the HTC One does feel very “solid” in my hands. However, the edges are a bit sharp and does feel a bit uncomfortable to hold it all the time but with a case, this problem should go away. Otherwise the HTC One has a very good “premium” feel like holding a gun or something. Yeah, it’s definitely metal. One of the features I was looking forward was the stereo speakers on the HTC One. It definitely is louder with slight amount of bass than any other smartphone on the market. But here, I was expecting too much as some tech reviewers had said it was so loud they had to turn it down. I am glad I did buy the phone to prove them wrong as you can also hear clearly in my video unboxing. The HTC One is slightly louder than the S4 or the Note 2, but not by much, and nowhere near my bluetooth speakers at normal volume. If you are expecting to replace your bluetooth speakers with HTC One’s new stereo speakers, don’t. These are very nice speakers but they are definitely nowhere near where people have been hyping up them to be. Also, the stereo effect doesn’t work as the speakers are not spaced far enough apart. (However, when I did lean in about 3-inches from the phone, I could hear some stereo, but I am definitely not going to put my nose on my phone all the time.) I would have actually preferred mono, front speakers on the HTC One with a bigger amp and louder single speaker. But I do still love the speakers, it’s definitely better than S4 and Note 2 by a notch. Screen on the HTC One looks beautiful, full 1080P display, nothing I can complain about there. People have been flaming over AMOLED vs. Super LCD but seriously, they are about the same, most people will not see any differences between the two but I will have a microscopic comparison for those of you who need the nitty, gritty. As for software, the HTC One ships with Android 4.1.2 with Sense 5.0. I was rather horrified when I first saw the 3-column app drawer (Update: You can change the app drawer to 4×5) with rather cumbersome toggle settings but then again, Sense never was never fully polished and refined for efficient real-life usage. I will definitely root it and install an AOSP ROM like CM10.1 soon just like I did with my One X. The worst was with HTC One’s new BlinkFeed feature. Upon signing into my Facebook, BlinkFeed would try to pull latest posts from all of my 5000 Facebook friends, causing havoc on system and heating up my HTC One over 90 degrees fahrenheit and my battery went from 80% to 20% within just 20 minutes. Even when not using BlinkFeed, it would try to sync with Facebook in the background, heating up my new phone like crazy. I couldn’t figure out at first what was going on and there’s no way to actually turn off BlinkFeed completely, a serious software flaw that HTC should fix on the next update for sure. The only way to turn off BlinkFeed is to go into BlinkFeed settings and uncheck all topics, websites, and your Facebook feed. After I did that, my phone finally started cooling down. If you look on YouTube, there’s literally a dozen videos showing you how to do this BlinkFeed fix, people shouldn’t have to jump through hoops just to turn the damn thing off. Worst of it all, BlinkFeed is exactly that, “just a feed”, I cannot choose my favorite websites , only the ones that’s available on BlinkFeed. It’s a nice feature HTC tried to incorporate, but failed miserably in my real life testing. The camera on the HTC? It seems pretty solid. Both the front and rear cameras on the HTC One have wider lens than any other smartphone on the market. This will be great for taking photos and videos in areas you don’t have enough space and give you that wide angle shot you are looking for. I am certainly looking forward to using this feature on the HTC One. The rear camera on the HTC also boasts one of the shortest F-stop at F2.0 (compared to Galaxy S4 F2.2), this will translate into better photos in low light. I should have a full comparison video on that later down the line. Overall, the HTC One is a very nice phone for the price you pay (if you buy the unlocked version like I did). If you are looking for the lowest-cost smartphone “right now” with the latest Qualcomm Snapdragon processor, 4G LTE support, stereo speakers, and wide-angle front/back camera, then HTC One might be the “One” for you. haven’t wanted to change the ROM or skinned with another launcher and frankly those of us that just have real friends on Facebook, and not FB collectors 5000, will love blinkfeed. Misinformation about battery usage, I call BS totally. You can change in settings to only update when you pull down from the top of the screen. The battery is about 50% better in day to day usage than my S3 and I’m a pretty heavy user. Sound on the phone is class leading regardless of how loud it is and the Beats enhancement is essential and you won’t want to turn it off. The camera is great in the daytime and Lumia 920 beating at night and HTC Zoe and all the numerous features with it are amazing. Not forgetting the important stuff… Call quality, is actually even better than iPhones thanks to the front speaker which doubles as the earpiece and HDR mic and noise cancelling. If you you were stupid enough to ROM the phone, all these features would be lost. Go see this phone yourself, you will want it 100%. It is a game changer like the first iPhone was. The first no compromise Android phone ever made. Faster than galaxy s4 lol even gsm arena, using through bench marks will disagree. Looser. Max unboxed the phone and gave us his views on the phone…. and so by the way, aluminum is NOT the best feeling in the world. Not every1 wants what you want. HTC Troll. Max’s Unboxing was based on his own personal opinion, an opinion that many people value and trust. He’s been through many roms/phones etc and you’d kinda think that Max knows what he is talking about. Sorry, but the HTC One, good as it is, is a flawed phone. all out, good build quality or not, the Galaxy S4, Xperia Z and even the Nexus 4/Optimus G/G Pro are much better phones than the One. HTC are on the right track hardware wise, but Software is where the games at, and that is where they fall out the bus a bit. Andi54, this is not a review. Titel says unboxing and if you watched the youtube video Max asked not to start a flame war (yet). HTC One, cus like him last 3 years all my mobile phones were Samsung. I think Samsung start to loose his edge and it’s time to try something fresh. Yep, I’m with you there, owned every Galaxy flagship until now. I don’t have brand loyalty, I just want whoever makes the best phone. Samsung, with their “Apple” like strategy of just pure marketing over R&D, have seriously dropped the ball this year. HTC and Sony on the comeback trail is ultimately great for us the consumer because Sanding will have to up their game. The talk is that they are already considering changing build materials in the Note 3 so I expect the S5 will be great. Me, myself, I can’t ever buy Samsung again in principle because my S3 died after only 9 from “Samsung sudden death syndrome”, a well documented and acknowledged design fault on the cops of in early Exynos S3s. Because I bought the phone in a different country Samsung UK not only refused to fix it for free, they would not even fix if I paid either…never buying their plastic trash again..
Yep, I’m with you there, owned every Galaxy flagship until now. I don’t have brand loyalty, I just want whoever makes the best phone. Samsung, with their “Apple” like strategy of just pure marketing over R&D, have seriously dropped the ball this year. HTC and Sony on the comeback trail is ultimately great for us the consumer because Samsung will have to up their game. The talk is that they are already considering changing build materials in the Note 3 so I expect the S5 will be great. Me, myself, I can’t ever buy Samsung again in principle because my S3 died after only 9 from “Samsung sudden death syndrome”, a well documented and acknowledged design fault on the cops of in early Exynos S3s. Because I bought the phone in a different country Samsung UK not only refused to fix it for free, they would not even fix if I paid either…never buying their plastic trash again..
Hey Max, when can you start showing off some sick roms for the HTC ONE. I love the phone and need recomendations. So far i have only tried one. Next story Galaxy S4 vs. HTC One BLINDFOLD FEEL TEST! Previous story Should you Buy Galaxy Note 2 or Galaxy S4?